Salt Springs, FL: Deep in the Ocala National Forest. Sort of – on a main road in the middle of nowhere. Same same. The short version for those interested more in facts than insights: Bear walks across the road, sits in the forest. I drive by, take his picture. The end. Oh, and I name him Gus. The longer version for those interested in magic and signs from the universe: Just a few days ago I was in the middle of a yoga training in this forest. This particular training was to learn to teach a form of meditation called Yoga Nidra. I have taken this training before and it is because of that that I chose to take it again. My last experience can be described as nothing short of blissful. This time? Bliss denied. I attended just half the training – an option since I had completed it three years ago. When I left on Tuesday I felt like it was too soon. I wasn’t done cooking. The next few days I became a little edgier, ragey inside. I wanted to throw something fragile against a wall. A physical exertion for the mental and emotional adrenaline that was building. Yoga Nidra is a meditation technique done lying down. It is guided the entire time – usually 30-40 minutes. Some people fall asleep, others remain completely alert the entire time and some go very deep into the subconscious and see images and sense the presence of pure consciousness. Most often it’s a combination of all of those experiences. Yoga Nidra helps release trapped emotions held in the body. Every time we take something in through the senses it either moves through the body effortlessly or, if we have a reaction to it, it becomes an energetic block. Yoga Nidra helps release those energetic blocks and held emotions by so completely relaxing the body and calming the mind. Did I lose you yet? Where’s the bear? Is that what you’re wondering? He’s coming. I have a very vivid imagination and the ability to visualize in great detail. The images that came up for me during the first training began as violent. War time stuff, fear, running, bloody and dirty people. I had no reaction to this, only that I must have some repressed anger or fear that is working itself out. Because I do a little work for the yoga institute I had to head back up on Friday. The training was still taking place and I would see all the friends I had to leave behind a few days earlier. I was happy to see them but still a little snappish and cranky. I decided to put my “workout” play list on as I drove. I turned it up. I sang it out. I felt better. The Ladies – Gaga and Miss Kier – can be quite healing. My mood began to lift. Better out. 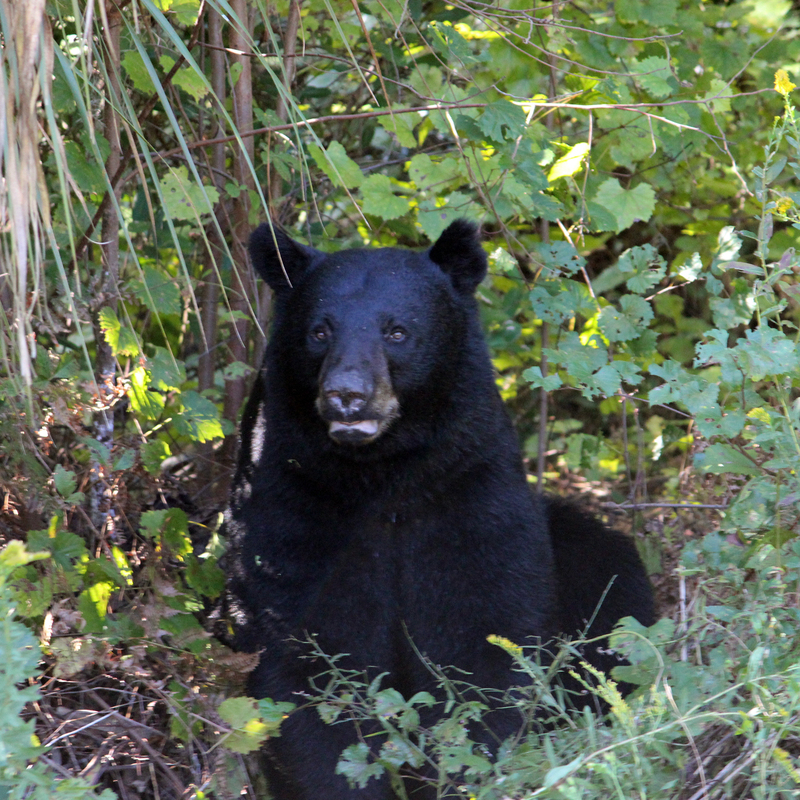 SInce moving to central Florida nearly 20 years ago, I have had ‘black bear sighting’ on my wish list. Twice I have seen them quickly, mostly in my rear view mirror as I sped through this very same forest. Yesterday was different. I saw him ahead in the distance. There were a few cars going in both directions. A big truck in front of me, no one behind and a couple of cars coming the opposite direction. He crossed the road from my side to the other. I slowed way down as I fumbled with the zipper on my camera bag. Just in case. Then I saw him. He had taken his time walking across the road so I could clearly see where he was going. He sat down facing the road just inside the edge of the forest. He waited for me. I rolled down my window. We looked at each other. We had an agreement. I was parked with my foot on the brake for a good 5 minutes. I took three photos. He gave me his profile, both sides, and his portrait, then he shrugged and walked deeper into the woods. I thanked him. During that time no one passed. There was not one car. Time was suspended and magic took over. 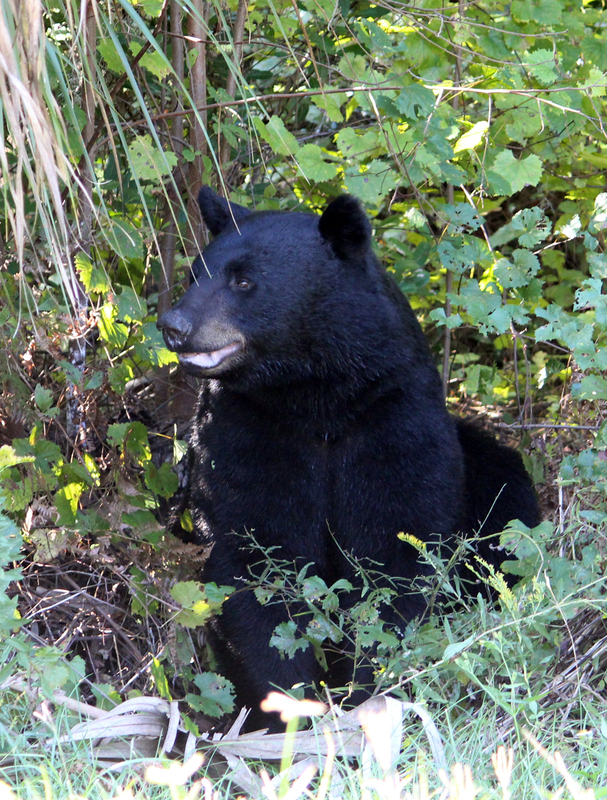 Trusting that everything has meaning, I was aware that the bear – Gus – was no exception. We had, after all, shared a moment. When I arrived at the ashram and shared my encounter, a friend handed me Ted Andrews’ Animal Speak Pocket Guide. Here’s what it said: “Bear (inner voice). Inner potentials are awakening. Trust your own unique rhythms, not those of others. This will bring the honey you seek.” Score! As I researched further, the Medicine Cards I have, ascribe Introspection as the meaning of bear. Just for the record, I had planned to wear this beautiful shirt I purchased in India. It has all the best colors for my complexion; blues and greens and white. I couldn’t put it on. I wasn’t feeling it. I chose a black shirt and army green pants. Why am I telling you this? Black is the color of introspection. I love the universe. It speaks loudly to me. It begs for my awareness and when I cave it showers me with gifts and signs. When I shared my cranky feelings with a friend and teacher he said it was a natural side effect of the Yoga Nidra. Something was moving up and out. I had to let it, so I could journey deeper inward. 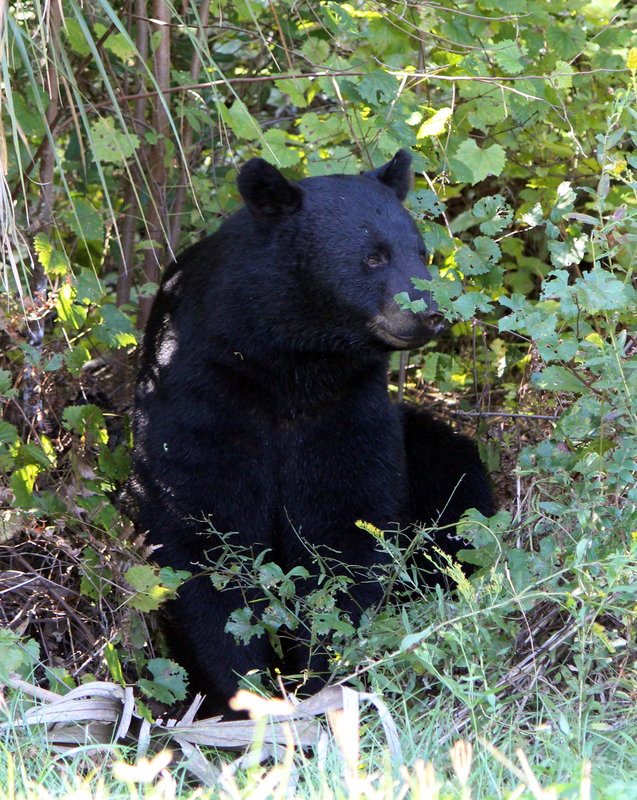 Oh, and I almost forgot to tell you, I saw a bear on my way out of the forest as well, walking down a dirt side road. I went back to investigate. I drove slowly down the dirt road toward him. I got pretty close. We locked eyes then nodded at each other. As he disappeared into the forest, I turned my car around and headed home. In silence. Beautiful writing, photos and spirit. Thank you! !